Starring Jason Clarke, Amy Seimetz, John Lithgow, Jeté Laurence, Hugo Lavoie, Lucas Lavoie, Obssa Ahmed, Alyssa Levine, Maria Herrera, Frank Schorpion, Linda E. Smith, Sonia Maria Chirila, Naomi Jean, Suzi Stingl, Kelly Lee, Nina Lauren, Alison O’Donnell, Raphaël Laporte, Simon Pelletier-Gilbert and Leo, Tonic, Jager and JD the cats. Distributed by Paramount Pictures. 101 minutes. Rated R.
In a recent interview, horror maestro Stephen King told Entertainment Weekly that he considered Pet Sematary his most disturbing novel. In fact, he said, had he not needed to use the book to get out of a bad publishing contract, he feels that he would have never released the tome. The manuscript would probably still be in some drawer somewhere. Gone, but not forgotten. Considering the fact that King has written dozens of books over the years, most of which are designed to give the reader nightmares, that’s a pretty powerful statement. 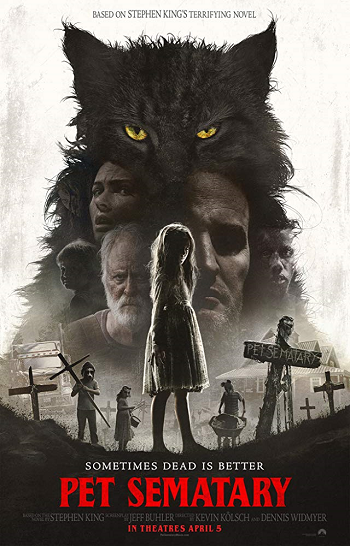 I’m not going to lie, I have not read Pet Sematary since it was brand new (about 35 years ago), and I have not seen the original film that was made of the novel since that was in the theaters 30 years ago. I remember liking both, but not being totally freaked out by either. I do have to say this, though, the new movie version of Pet Sematary is spooky as hell. I mean it, it’s one of the most chilling horror films I’ve seen in a long time. Quite probably since the film reboot of another one of the novelist’s classic books – IT (of which the second half is coming down the pike just a few months after Pet Sematary). Pet Sematary is both faithful to the source material and experiments with it. There is one massive and very basic change to the story line. However, the new film does not mess with the atmosphere of the story. The alteration even makes a certain amount of sense as far as straight narrative goes. It actually leads into an ending that is – if possible – even more disturbing than the original film’s closing shot. The storyline is as well-known as it is horrific. Dr. Louis Creed (Jason Clarke) decides to move his family – wife Rachel (Amy Seimetz), eight-year-old daughter Ellie (Jeté Laurence) and toddler son Gage (played by both Hugo and Lucas Lavoie) – from the bustle and danger of the big city to a rustic farmhouse in Maine. Little did he know that dangers show up everywhere. They quickly learn from their kindly neighbor Jud (John Lithgow) that their property houses the local pet cemetery (misspelled on the sign, of course, leading to the title). Sadly, the cemetery gets a lot of traffic, because they live right off a road where trucks speed by day and night. When Ellie’s beloved cat Church (short for Winston Churchill) falls victim to that busy roadway, Jud lets Louis in on a secret about his new property. Beyond the pet cemetery, obscured by a haphazard log wall, is an ancient Native American burial ground. It is magic – or cursed – so that anything that is buried on the ground will come back to life and return to you. But it will never be the same as it was. Louis buries Church and the cat returns, but it is filthy, smelly and mean-spirited – constantly growling, hissing and lashing out. You know it’s only a matter of time before someone takes a human being to the burial ground. And then, watch out! Pet Sematary is a terrific example of lean and mean horror storytelling. It is a triumph of mood over common sense. It has a nightmare logic and is hard to get out of its spell. Tags: Alison O'Donnell, Alyssa Levine, Amy Seimetz, cats, Dennis Widmyer, Entertainment Weekly, Frank Schorpion, Hugo Lavoie, Jager, Jason Clarke, Jay S. Jacobs, JD, Jeff Buhler, Jeté Laurence, John Lithgow, Kelly Lee, Kevin Kölsch, Leo, Linda E. Smith, Lucas Lavoie, Maria Herrera, movie review, Naomi Jean, Nina Lauren, Obssa Ahmed, pet cemetery, Pet Sematary, PopEntertainment.com, Raphaël Laporte, Simon Pelletier-Gilbert, Sonia Maria Chirila, Stephen King, Suzi Stingl, Tonic. Bookmark the permalink.